Welcome once more into the world of open games! Our second article takes us on a ride through one of the most important openings starting with 1.e4 e5. This is an opening that is tied to romantic, classical chess: we are talking about the Italian Game. It is the second most common opening in the open games, only overcome by the Ruy López. As you already know, it is crucial for any chess player to be familiar with the open games, as 1.e4 e5 is the most widely played combination of moves. 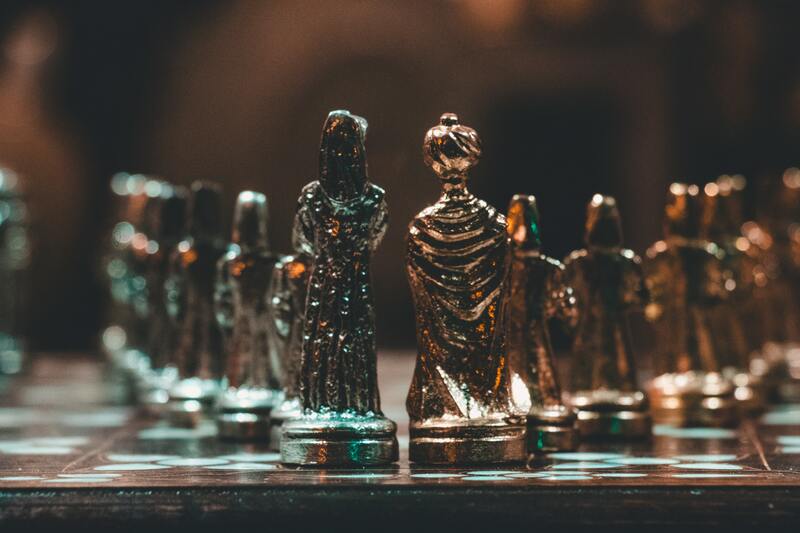 From young children starting out their chess adventure, to remarkable masters and World Champions – it can be found on any chess board in the world! The Italian Game, also known as the Giuoco Piano, is one of the oldest recorded chess openings. 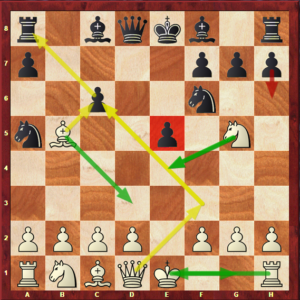 Its first games date back to the 16th century – nevertheless, it is still in good theoretical standing nowadays, and many top chess players employ it in their games as an alternative to the overly analyzed Ruy López. How does the Italian Game happen on the chess board? Diagram 1a: The Italian Game – starting position. 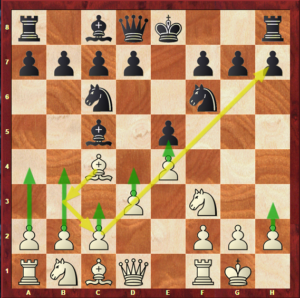 Diagram 1a shows the move that characterizes the Italian Game: 3.Bf1-c4. This is our fundamental position, and the one that will act as a basis for the whole article. Carefully looking at it is the first step towards mastering this opening – however, when you do so, you may find yourself wondering why is this move any good, and that is when the next section comes in. Why play the Italian Game? Choosing the openings that will be a part of your repertoire and those that will be left out is always a delicate process. Sometimes, there is no proven evidence that one opening is better than the other – you may simply prefer playing it. 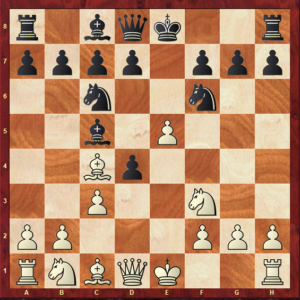 If you have the White pieces and have figured out that you are mainly a tactical player who likes to have a dynamic and active position, clearly playing 1.e4 is a well-suited choice. When you are building your 1.e4 repertoire, you will find that deciding what to play against 1…e5 will be one of the hardest parts. There are plenty of options, and there is a real possibility of getting caught up in the theory without knowing what to do. White’s idea of developing the Bishop to c4 is simply natural and effective. From c4, the Bishop is targeting the f7 pawn, the weakest in Black’s field, being only protected by his King and no other piece. It is only natural to choose this square for the Bishop over other options, as it is where it stands the most active and ready to be used in a Kingside attack. Being less played than the Ruy López, you will most likely come across some unprepared opponents, who did not dedicate as much time to learning the Italian Game as they should have. Convinced? If the answer is yes, let’s not waste one more second and start learning all about the Italian Game! How does Black reply to 3.Bc4? Black has three main alternatives. We will analyze each of them individually. Diagram 1b: The Hungarian Defense: starting position. 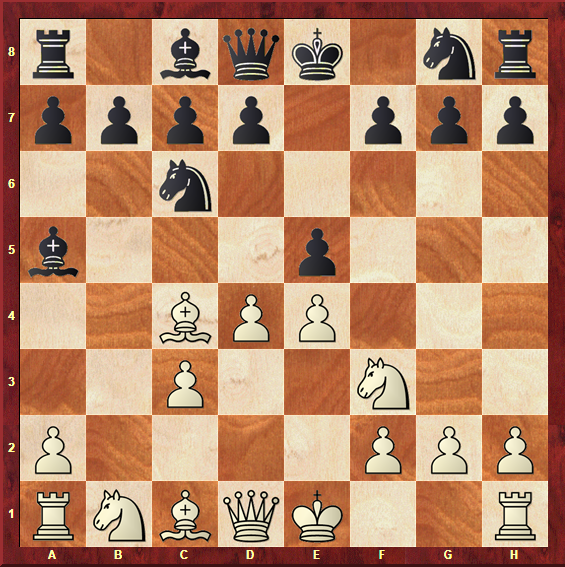 3…Be7 is a modest and quiet move, that tries to neutralize the power of the Italian Game by heading towards a drawish position. This variation was named after a correspondence game that took place between the cities of Paris and Pest, Hungary, in the middle of the 19th century. 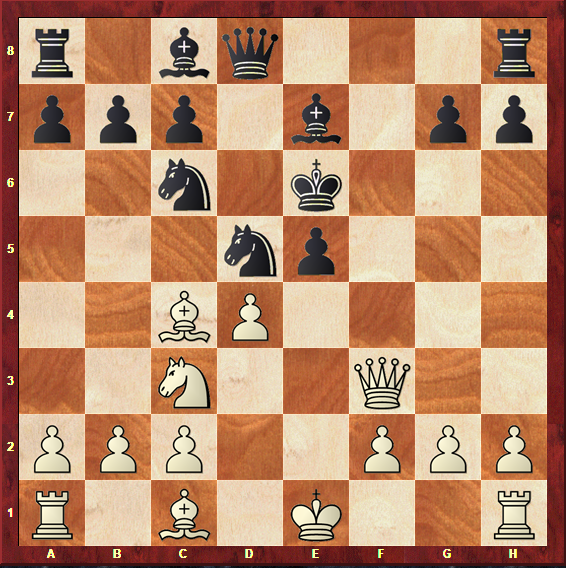 By playing this move, Black avoids the complications of 3…Nf6 and 3…Bc5. However, if you intend on fighting for the full point, this might not be the best option for you. In most positions, White takes control over the central area of the board and gets a lead in development and a spatial advantage. This means that many positions will be passive and cramped for Black. Usually, White plays 4.d4, in order to occupy the center immediately. Let’s take a look at the first of those. 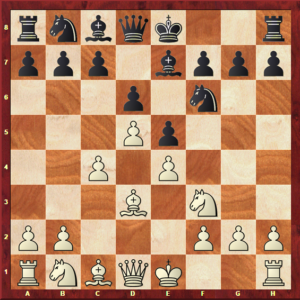 Diagram 1c: The Hungarian Defense: position after 4…exd4. If this position seems familiar to you, perhaps you have already studied our Scotch Game article. The Scotch Game is an opening in which White takes control over the center with d2-d4 from early on, and it leads to positions that are similar to this one. However, this position presents an inferior version of the Scotch Game for Black. Black wants his Bishop to be on c5, and not on e7. It is a bad square for this Bishop for two reasons: first of all, it is very passive, whereas on c5 it puts pressure on White’s Kingside; secondly, often, Black wants to play Qd8-f6 to put pressure on White’s center, which cannot happen as easily with the Bishop standing on the way. For this reason, players have started drifting to the alternative we had discussed earlier: 4…d6. Diagram 1d: The Hungarian Defense: position after 4…d6. This move is not very aggressive or challenging; but, then again, neither is the Hungarian Defense. It makes sense to support the center with d7-d6. However, as we have mentioned before, such a passive setup will allow White to grab a spatial advantage and a lead in development. 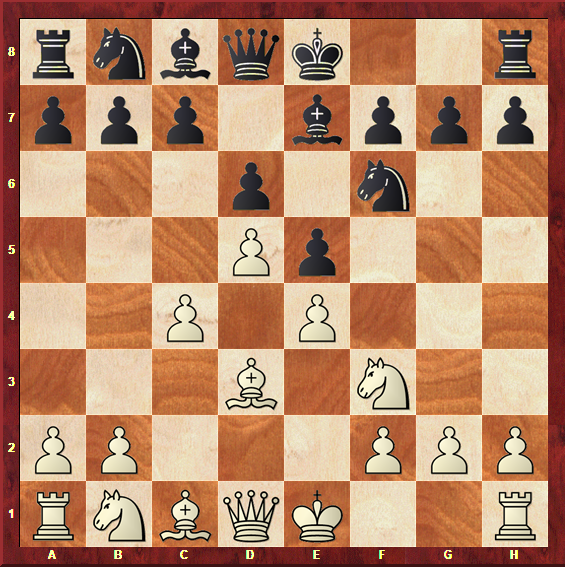 Diagram 1e: The Hungarian Defense: position after 7.Nc3. White has a lead in development and a comfortable position. However, many pieces have been swept off the board, and Black has good chances of achieving a draw. For this reason, players who think that the Hungarian Defense is not a big threat to the Italian Game have started looking for an alternative. The most ambitious way of playing is with 5.d5, increasing the central control even further. 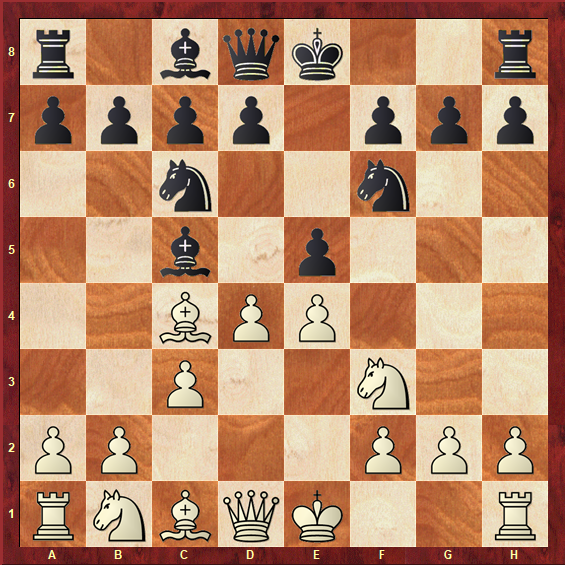 Diagram 1f: The Hungarian Defense: position after 5.d5. This is a good move for many reasons. 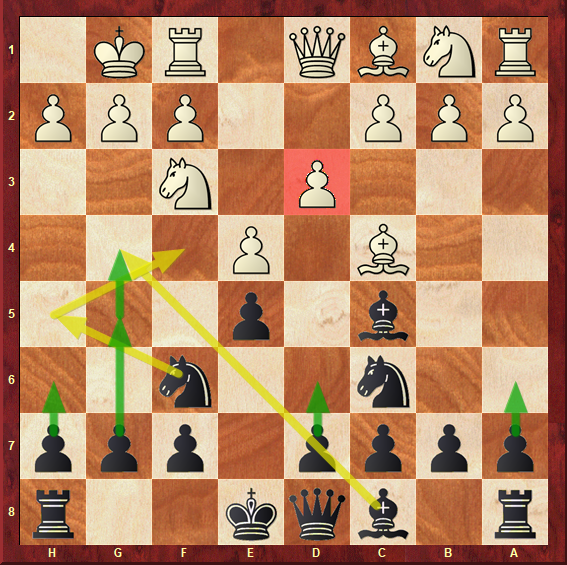 It locks in Black’s Bishop on e7, it grabs more space in the center and it attacks Black’s Knight. Black usually replies by bringing the Knight to b8. 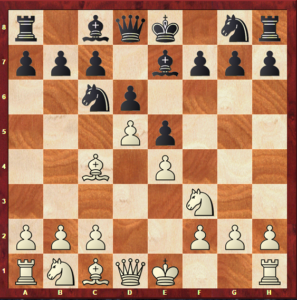 Bringing it to a5 is not a good idea, as it can potentially run out of squares once White retreats his Bishop to e2. Diagram 1g: Black’s misplaced Knight on a5. For this reason, Black’s best option is the modest retreat of the Knight to its original home, b8. 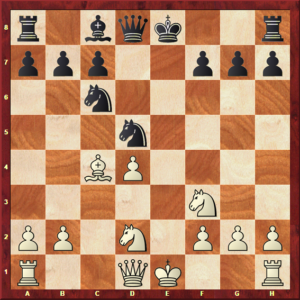 Diagram 1h: The Hungarian Defense: position after 7.c4. This dominating position is the reason why the Hungarian Defense is seldom seen in chess boards nowadays. Usually, players with the Black pieces want to fight for a win, and choose one of the most complex and ambitious options: either 3…Nf6 or 3…Bc5. Before we get to those main lines, let’s briefly summarize the plans for White and Black in the Hungarian Defense. To grab space in the center with d5-c4. 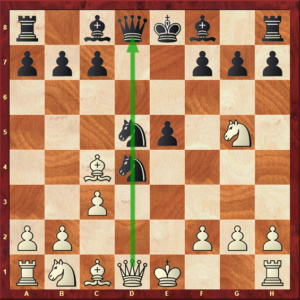 Aim to expand even further on the Queenside, since the chain e4-d5 is pointing there. An important idea is b2-b4 followed by c4-c5. If Black plays c7-c6 to challenge the center, always take on d5 with the c-pawn, to maintain structural balance. Diagram 1i: White’s plans in the Hungarian Defense. Challenge White’s center with c7-c6-cxd5. 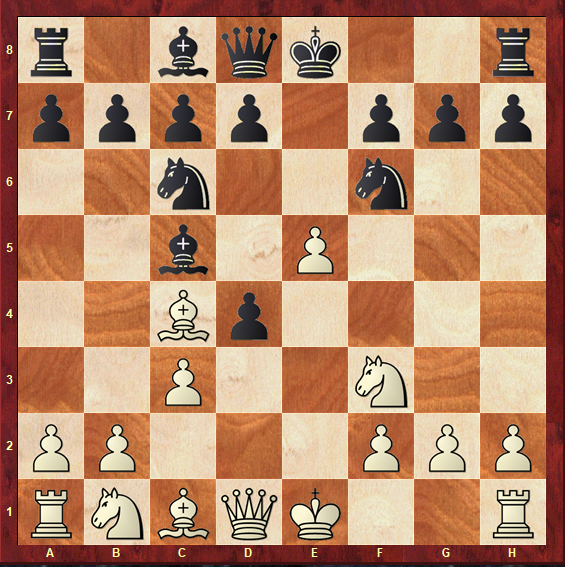 Even if White takes back on d5 with the c-pawn to maintain structural balance, it is good to exchange pieces and pawns when you have less space. Expand on the Kingside, possibly with f7-f5, since the c7-d6-e5 chain is pointing in that direction. Diagram 1j: Black’s plans in the Hungarian Defense. Diagram 1k: The Two Knights Defense: starting position. The Two Knights Defense is actually more of a counterattack than a defense. It is a daring and ambitious alternative for Black. While 3…Bc5 leads to more balanced, classical-type positions, players who like to throw in some confusion on the board will feel at home with 3…Nf6. There are three different approaches for White once this move is on the board. One of them is to transpose into the Max Lange Attack or the Dubois-Reti Variation, with the move 4.d4. We have extensively covered this move under the Scotch Gambit section of our article on the Scotch Game, which you can check out here. We highly recommend you to learn more about these variations by reading this article. Diagram 1l: Transposition into the Max Lange Attack/Dubois-Reti Variation. Diagram 1m: The Two Knights Variation: position after 4.d3. This is a quiet and solid move, very much in the spirit of this opening. Many positional players will find this to be the safer option to deal with the Two Knights Defense. It makes perfect sense to play 4.d3 for a simple reason: if Black replies with 4…Bc5, we will find ourselves in the Giuoco Pianissimo, a variation that we will extensively cover under the c) 3…Bc5 section, as that is the most common move order to reach it. 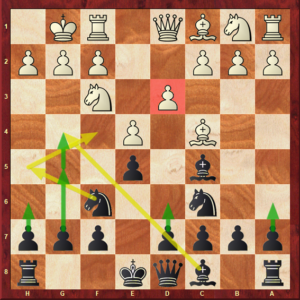 Therefore, since we will soon learn all about the Giuoco Pianissimo, let’s focus on an important alternative to this move by Black: 4…Be7. 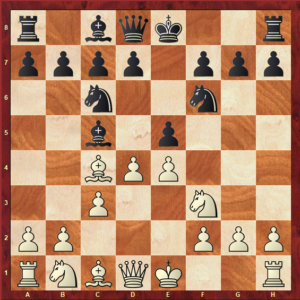 Diagram 1n: The Two Knights Defense: position after 4…Be7. This is a smart reply for Black. 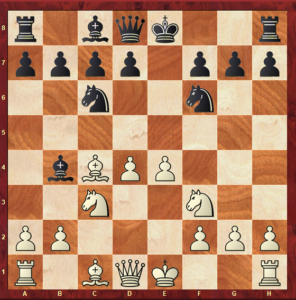 White’s intention behind playing 4.d3 is clearly to transpose into the well-known territory of the Giuoco Pianissimo, and this move is a decent alternative to it, that may catch White by surprise and perhaps even unprepared. It is certainly not as active as Bf8-Bc5, as the Bishop is far more active on that square. But, if you think about it, White’s d2-d3 is also not as active as d2-d4 or Nf3-g5 – and it is still a very sound move. The same is true for 4…Be7. 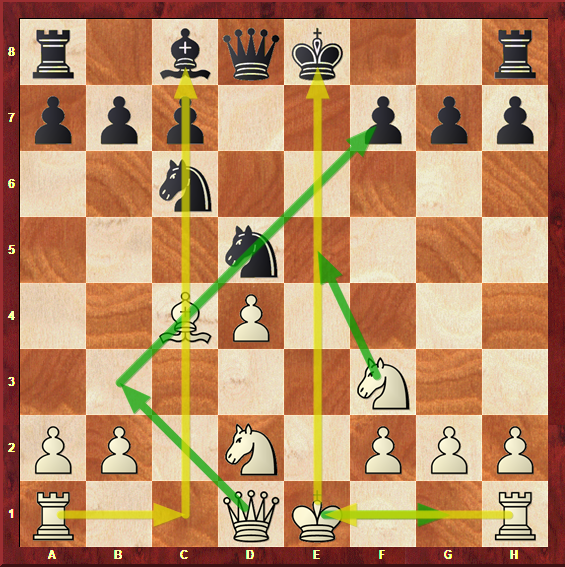 Diagram 1o: The Two Knights Defense: position after 6…d6. As you can see, the above diagram shows a typical position of the Italian, in which Black’s Bishop is on e7 instead of c5. This has its pros and cons: on one hand, it is certainly more passive on e7; on the other hand, White’s plans of playing Bc1-g5 to pin the Knight to the Queen and c3-b4 to chase the Bishop on c5 with tempi (typical plans of the Giuoco Pianissimo, as we will see in the next section) are not possibilities in this position. Let’s briefly summarize the plans for both players in the 4.d3 Be7 variation of the Two Knights Defense. 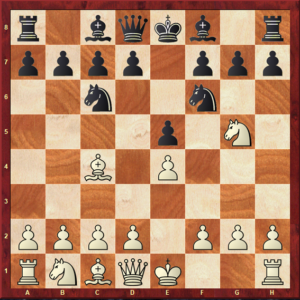 Diagram 1p: Plans for White in the 4.d3 Be7 variation of the Two Knights Defense. 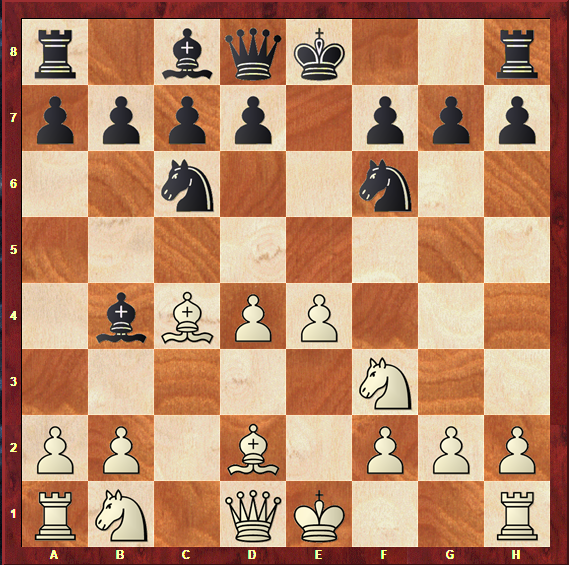 Play Bc8-e6 to exchange light-squared Bishops, as White’s Bishop is especially powerful on the a2-g8 diagonal. 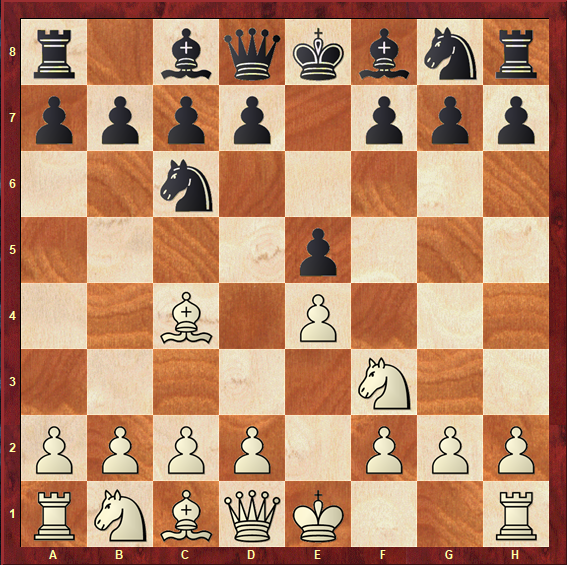 Diagram 1q: Plans for Black in the 4.d3 Be7 variation of the Two Knights Defense. Please note that neither side is particularly interested in playing on the Kingside. 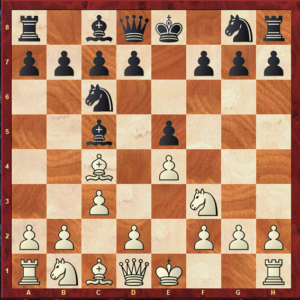 This happens because games in the Italian, especially in these quiet variations, are mostly slow-paced and positional, and playing aggressively on the Kingside is rarely a good idea, since it can lead to significantly harming and exposing your own King. Diagram 1r: The Two Knights Defense: position after 4.Ng5. This variation is, perhaps, the complete opposite of 4.d3. White plays a sensible move, defending the e4 pawn while attacking the weak f7 pawn. This is one of the rare occasions in which we can experience double-edged and aggressive play in the Italian Game. 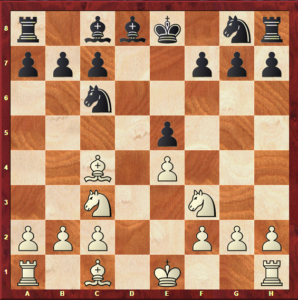 By playing this move, a position in which both sides must be extremely precise is achieved. 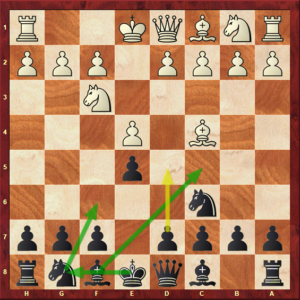 First of all, Black must do something to stop the immediate threat of Nxf7, forking the Queen and Rook. 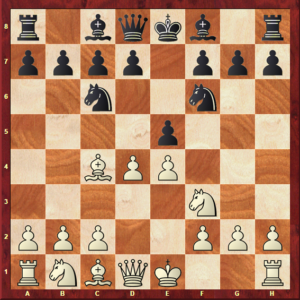 Therefore, he plays a logical move, trying to exploit the fact that White’s pieces are quite advanced for the early stage of the game: 4…d5. Diagram 1s: The Two Knights Defense: position after 4…d5. 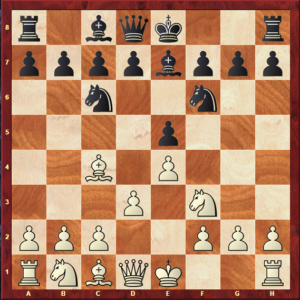 This move simultaneously attacks White’s Bishop and prevents the threat of taking on f7. White must continue with 5.exd5, the only move that makes sense. 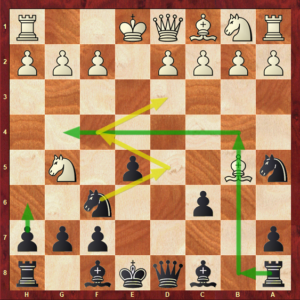 Otherwise, he would be allowing Black to take full control of the center, and take any purpose away from moving the Knight to f7. 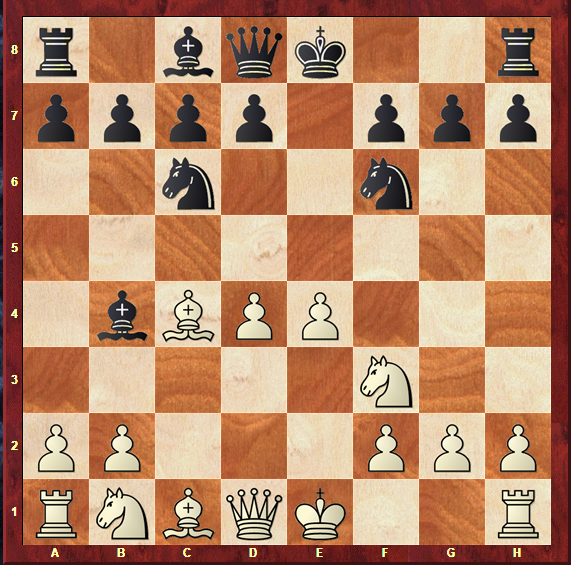 This Knight move is only powerful if White can pair it with the Bishop on c4 to create multiple threats on f7. However, Black’s response is not as straightforward. Taking back on d5, which can easily be mistaken for the best move in the position, is actually considered to be a mistake. 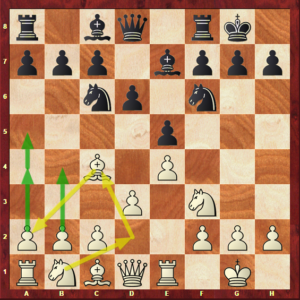 Diagram 1t: The Two Knights Defense: position after 5…Nxd5. This seemingly innocent and natural move allows White two venomous responses: 6.Nxf7, known as the Fried Liver Attack, or 6.d4, the Lolli variation. Diagram 1u: The Fried Liver Attack: position after 8.Nc3. 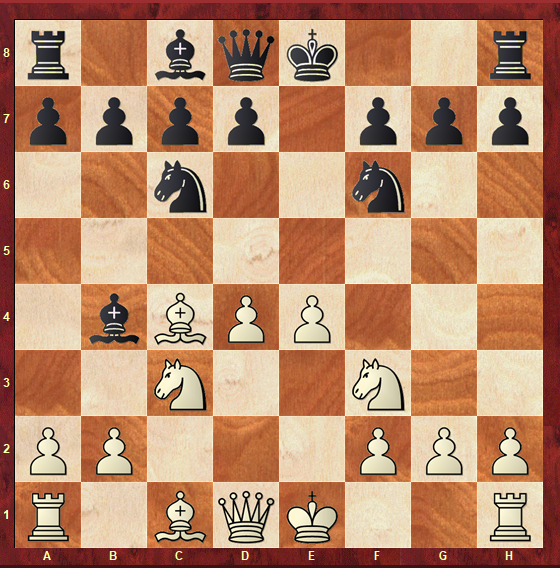 As you can see for yourself, White’s Knight on d5 finds himself under an enormous amount of pressure, applied by White’s Knight on c3, Bishop on c4 and Queen on f3. White is going to win the piece back with a considerable advantage, since Black’s King will be left in the middle of the board, having lost the right to castle. On the other hand, the Lolli variation also comes to show that 5…Nxd5 is a mistake for Black. Diagram 1v: The Lolli Variation: starting position. If Black takes with the Knight on d4 (7…Nxd4), White can play 8.c3 and create all sorts of threats along the d-file. Diagram 1w: The Lolli Variation: position after 8.c3. Taking with the pawn on d4 is not a great idea either. White can simply castle and achieve a massive lead in development, entering a position in which Rf1-e1 is a powerful threat. Diagram 1x: The Lolli Variation: position after 7.0-0. Last but not least, Black is not in time to castle and save himself from trouble. Diagram 1y: The Lolli Variation: Position after 7…Be7. If he plays a natural move like 6…Be7, we see a mix between the Lolli variation and the Fried Liver Attack happening on the board, after the move 7.Nxf7, followed by the usual continuation of Qf3+ and Nc3. 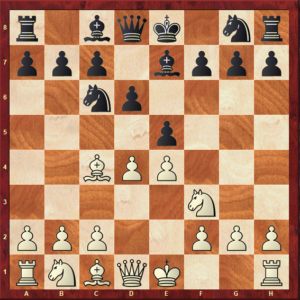 Diagram 1z: The Lolli Variation: position after 9.Nc3. Once theoreticians started to realize that 5…Nxd5 was not the way to go in order to achieve equality with the Black pieces, they came up with a significantly better reply: 5…Na5. Diagram 2a: The Two Knights Defense: position after 5…Na5. This move comes from a correct interpretation of what is going on in the position. The matter of urgency for Black is not to take back material, but to prevent White from reaching a dominating position, and his own King from being left in the center of the board. It gains an important tempo on the c4 Bishop. As it is forced to move, Black has one more move to try and settle down his position. Since White does not want to lose time, he moves the Bishop to the most natural square: b5, with check. Diagram 2b: The Two Knights Defense: position after 6.Bb5+. Since the natural Bc8-d7 allows White to secure the material advantage of the pawn on d5 rather easily and comfortably, with Qd1-e2, protecting the Bishop and attacking the e5 pawn, Black decides to sacrifice the pawn in an active way, in order to free his own pieces. 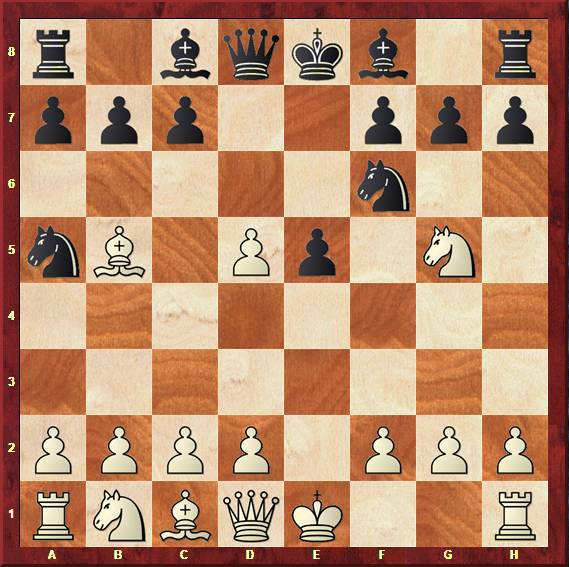 The most played move is 6…c6, to which White replies 7.dxc6, with the idea of consolidating his material advantage. 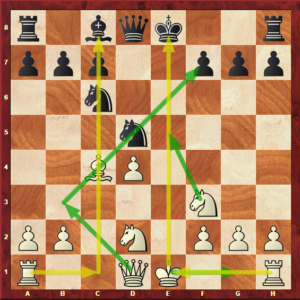 Diagram 2c: The Two Knights Defense: position after 7…bxc6. Play 0-0, followed by Rf1-e1 and pressure on the e5 pawn. 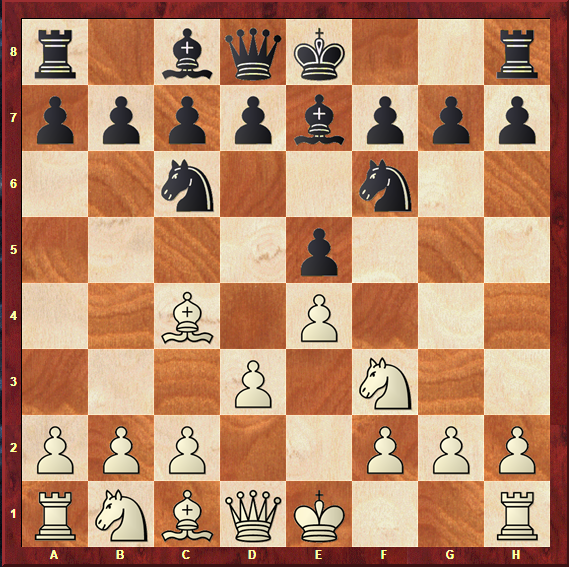 Diagram 2d: Plans for White in the 4.Ng5 variation of the Two Knights Defense. Take advantage of the open b-file and play Ra8-b8. 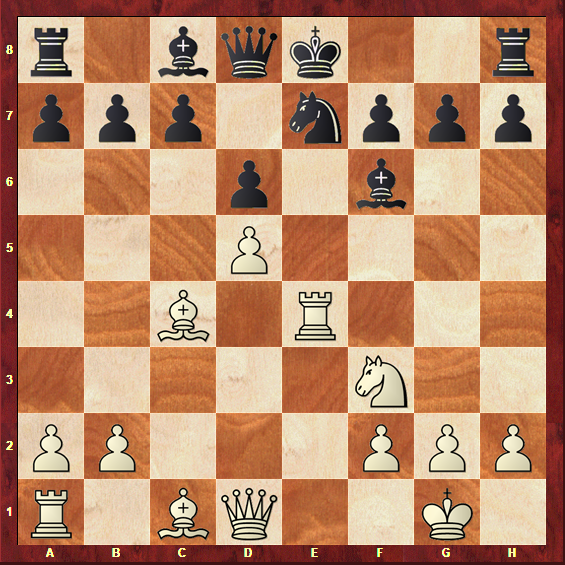 Sometimes, Black also has creative ideas of playing a rook lift, with Rb8-b4-g4 followed by a Kingside attack. Diagram 2e: Plans for Black in the 4.Ng5 variation of the Two Knights Defense. 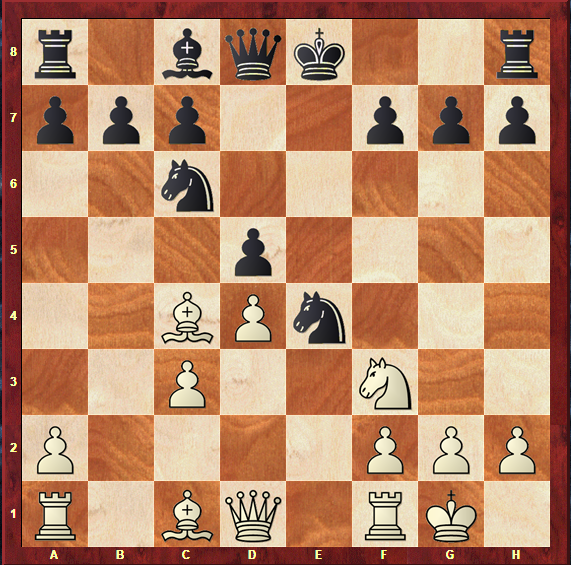 Please note that this variation leads to a very specific kind of play: White has a material advantage but will have some trouble dealing with Black’s activity; Black has a dynamic and active position, but can’t afford to lose too much time or exchange too many pieces. It comes down to a matter of taste. If you are a solid and positional player, you will certainly feel better with the idea of playing 4.d3. If, on the other hand, you enjoy the thrill of the fight, 4.Ng5 is the way to go! Diagram 2f: Giuoco Piano: starting position. If this variation sounds familiar to you, it may be because you have heard someone call the Italian Game the Giuoco Piano before. While those two names are often used as synonyms, the Giuoco Piano is the position on diagram 2c; while the Italian Game is a wide designation that refers to a set of many different openings, that can be achieved in response to 3.Bc4. It includes the Two Knights Defense and the Hungarian Defense that we have analyzed earlier. Giuoco Piano means “Quiet Game” in Italian – it was named as such to distinguish this opening from the most aggressive lines played against 1.e4. Let’s analyze each of these options on their own. Diagram 2g: The Evans Gambit: starting position. White’s idea behind this move is to break the centre open with c3 and d4, while Black loses time with his Bishop. Other ideas are to develop the Bishop to a3 and Queen to b3, targeting the f7 pawn and preventing Black from castling. All of this, of course, happens with the cost of a pawn, since it is a gambit we are talking about. 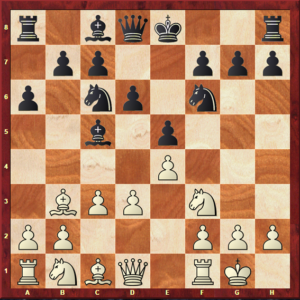 Many players feel uncomfortable with the idea of giving material away in the opening stage – which is why the Evans Gambit is not one of the most popular continuations for White. Black’s ideas will be to take this pawn and settle the position down with a material advantage. One of the main goals would be to exchange Queens, as that would slow down White’s counterplay chances, and approach a favourable endgame with an extra pawn. 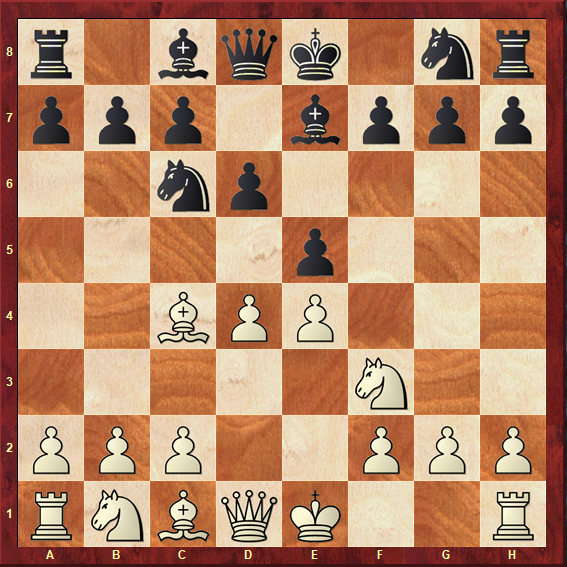 Diagram 2h: The Evans Gambit: position after 6.d4. As you can see, both sides are headed towards their goals. Black has taken the pawn and is holding on to the material advantage, and White has taken control of the center with c3-d4, while forcing Black’s Bishop to retreat to a5. 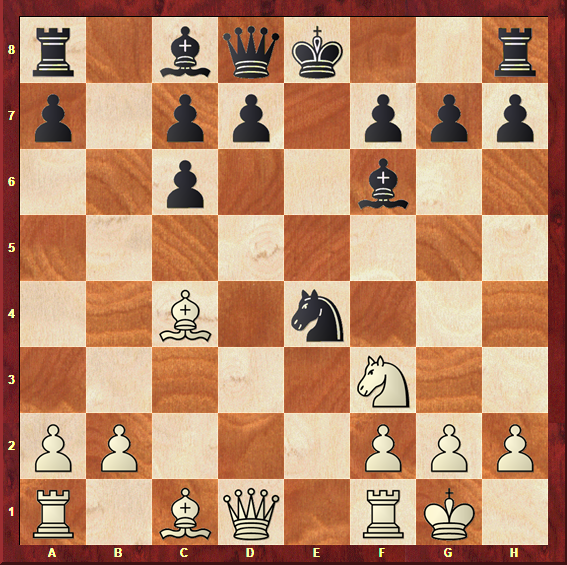 While the Evans Gambit is certainly interesting and aggressive, it is considered rather dubious. White gives a pawn away for central control and piece development, but, with accurate play by Black, this is not enough to claim an advantage. Let’s briefly summarize the plans for both sides in the Evans Gambit. 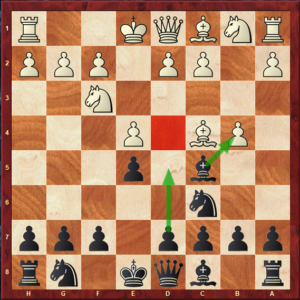 Develop the dark-squared Bishop to a3, in order to prevent Black from castling. Diagram 2i: Plans for White in the Evans Gambit. 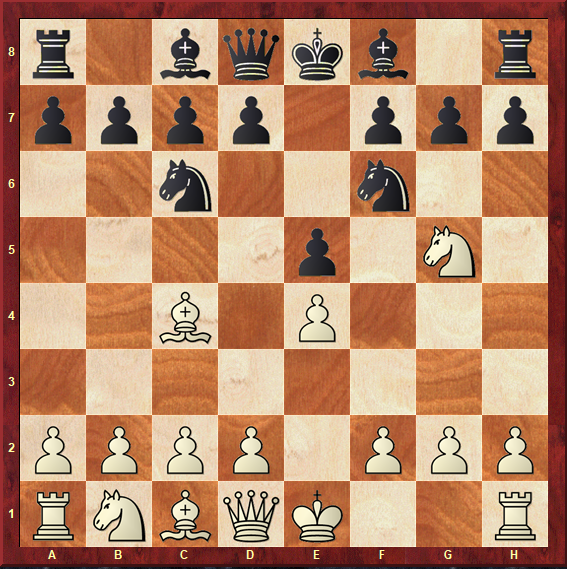 Proceed to target White’s weak isolated pawn on d4 after d5-e4xd5 and e5xd4-c3xd4. Diagram 2j: Plans for Black in the Evans Gambit. 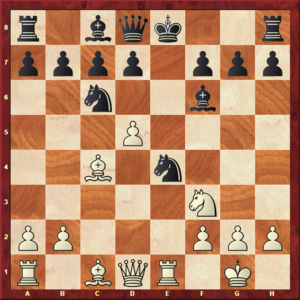 Diagram 2k: Giuoco Pianissimo: starting position with 4.d3. Diagram 2l: Giuoco Pianissimo: starting position with 4.0-0. If “Giuoco Piano” is Italian for “Quiet Game”, “Giuoco Pianissimo” means “A Very Quiet Game”. With this setup, White’s aim is to slowly build up the position. Some of the most common ideas are to open the centre with c3 and d4, to expand on the Queenside with a4 and b4, and to bring the Bishop from c4 to c2 via b3, in Ruy López style. We include both 4.d3 and 4.0-0 in this section, because once White plays d2-d3, we have a Giuoco Pianissimo position; and once White plays 4.0-0, Black’s only logical follow-up is to play Ng8-f6, developing a piece and attacking the e4 pawn – to which White replies with the only move to protect it effectively, d2-d3, getting into the Giuoco Pianissimo once more. This variation has the reputation of being slow and drawish. 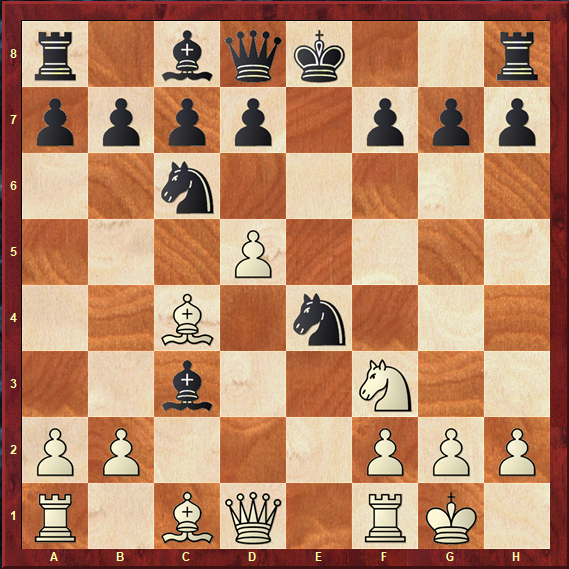 However, Black can often counter this with energetic play, by bringing a Bishop to g4 and expanding on the Kingside with f7-f5 and g7-g5. An important maneuver is Nf6-h5-f4. f4 is a great square for the Knight, from where it can unleash a Kingside attack and limit White’s dark-squared Bishop. Diagram 2m: Giuoco Pianissimo: position after 7.Bb3. As you can see, both players are slowly developing their pieces and securing their central position. Black can delay playing d7-d6 for a while, by playing 5…0-0 instead, but he will have to end up defending his e5 pawn and allowing the c8 Bishop to see the light of day. White can also choose different move orders: he can start by expanding on the Queenside with 6.a4, or pinning the Knight on f6 to the Queen with Bc1-g5. Please note that the plan of playing Bg5 is only effective when Black has already played d7-d6, since he won’t be able to retreat his Bishop to e7 and dissolve the pin. 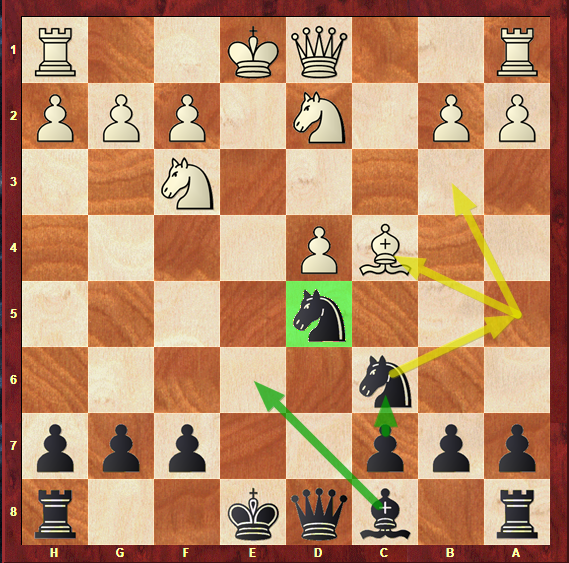 Play h2-h3, to prevent Black’s active ideas on the Kingside. Diagram 2n: Plans for White in the Giuoco Pianissimo. Play a7-a6 to delay White’s play on the Queenside, and provide the c5 Bishop a safe square to retreat to. Diagram 2o: Plans for Black in the Giuoco Pianissimo. Diagram 2p: Main line of the Giuoco Piano: starting position. 4.c3 is considered to be the main line of the whole Italian Game. It does not mean that it is better than 4.d3 or 4.b4 – choosing an opening is always a matter of style. 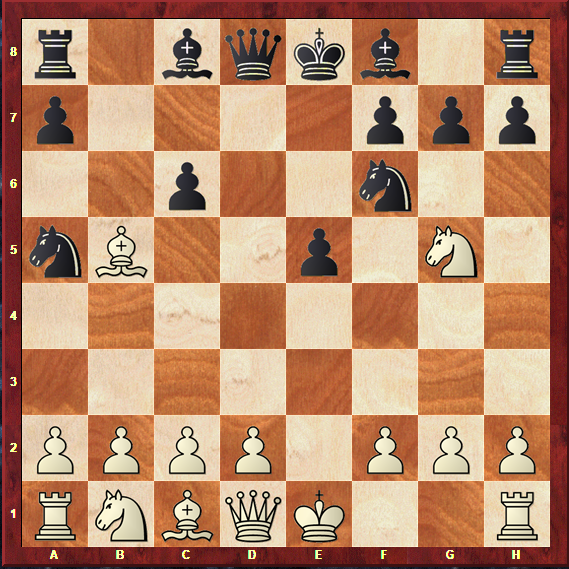 However, it is widely played by 3.Bc4 players because it follows White’s plan. It is an extremely logical move, since it will be followed by d2-d4. That way, White will control the entire central area of the board. Black’s main reply is 4…Nf6, attacking the e4 pawn and developing a piece to a natural square, and White plays 5.d4, the logical follow-up to 4.c3. Please note that if White plays 5.d3, protecting the e4 pawn, we transpose into the Giuoco Pianissimo, covered in section c2 of this article. Diagram 2q: Giuoco Piano: position after 5.d4. This position has been extensively studied and is a must-know for any 1…e5 player. 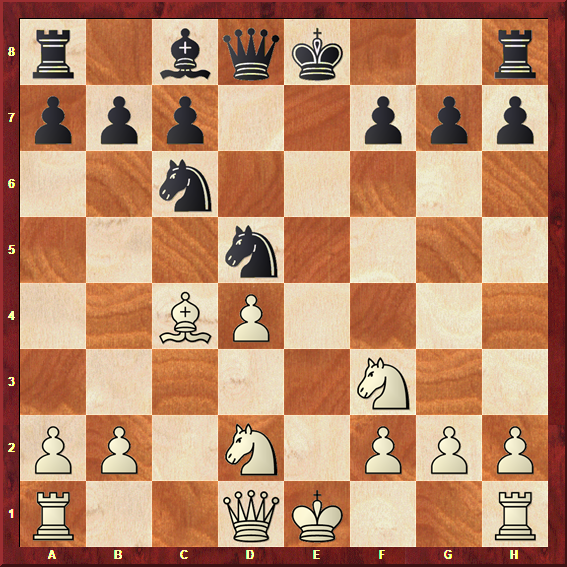 Black replies with 5…exd4, so as not to allow White to expand even further with d4-d5, and White is faced with a choice: either to advance e4-e5, or to take back on d4 with the c-pawn. 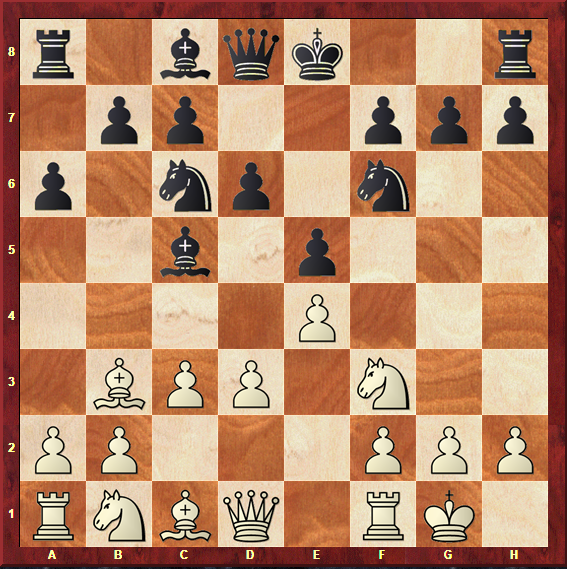 If White pushes 6.e5, we reach the position in diagram 2r. Diagram 2r: Giuoco Piano: position after 6.e5. In this variation, White has a clear idea: to harass the f6 Knight while expanding in the center. 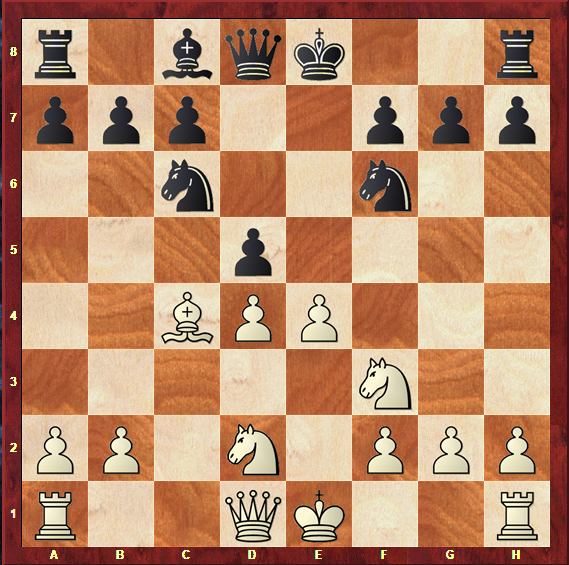 However, Black has a smart reply: 6…d5!, threatening White’s Bishop in return, and counter-attacking in the center. This variation leads to an equal position, provided that Black plays this move. White has not managed to achieve any particular advantage. Diagram 2s: Giuoco Piano: position after 6…d5. Taking back on d4 is, therefore, by far the most commonly played move, as 6.e5 does not bring White the advantage he wants to get out of the opening. After 6.cxd4, Black has to move the attacked Bishop on c5, otherwise it would get taken for free. 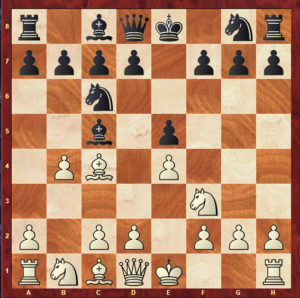 The most logical idea is to move it to b4 with check – that way, Black does not lose a tempo, as White is forced to interpose a piece or move his King. Diagram 2t: Giuoco Piano: position after 6…Bb4+. 7.Bd2 – a quiet line in which many pieces are exchanged and an endgame is soon reached. Black may achieve equality rather easily in these positions. 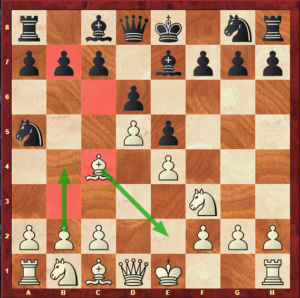 7.Nbd2 is not a great idea as it blocks in White’s dark-squared Bishop and pins the Knight in an unfavourable way – with 7.Nc3, there is always the possibility of playing Bc1-d2 to break the pin. Of course, 7.Kf1 or 7.Ke2 misplace the King and lose the possibility of castling, which leaves Black with a comfortable advantage. Let’s start by taking a look at the first of those. Diagram 2u: Giuoco Piano: position after 7.Nc3. Diagram 2v: Giuoco Piano: position after 9.d5. White’s last move may appear as a surprise to you, but please note that recapturing on c3 with the pawn would allow Black to stabilize his position by playing 9…d5, as diagram 2u shows. Here, Black has supported his Knight on e4 and counter-attacked in the center, and he’s ready to castle on the next move. Taking on c3 is not a possibility for Black, as White can play Qe1+ and win the Knight. Diagram 2w: Giuoco Piano: position after 9…d5. 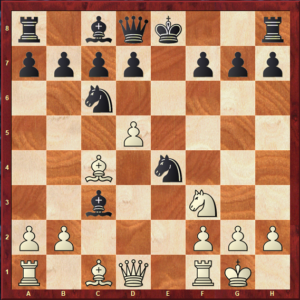 The idea of Black quickly stabilizing and being a pawn up was not pleasant for theoreticians of the Italian Game. They came up with 9.d5 as an alternative. 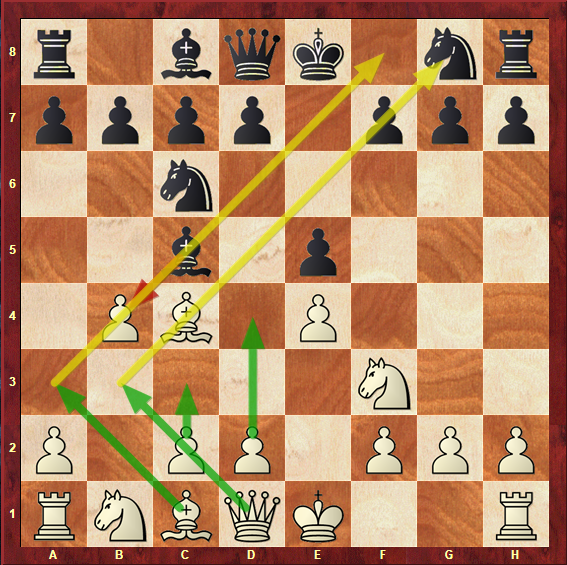 This is the type of move that you must know beforehand, or it will be extremely tough to come up with it on your own at the chessboard! 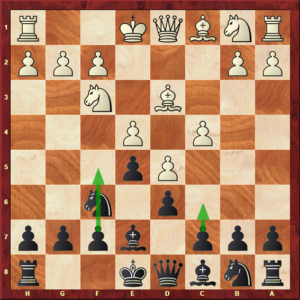 In the position in diagram 2w, you can see that Black has two pieces under attack: the Bishop on c3 and the Knight on c6. He chooses to retreat his Bishop to f6. 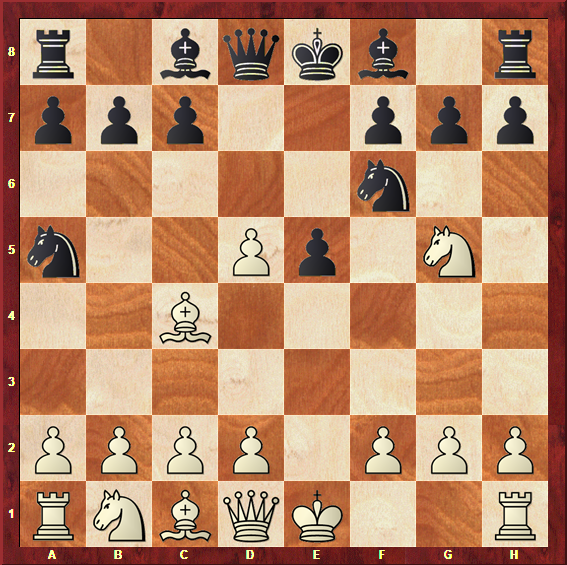 This is a wise choice, because the Bishop is a strong piece in the long diagonal – and also because if White simply captures on c6, Black can take back with the b-pawn and achieve an advantageous position, being two pawns up, as the following diagram comes to show. Diagram 2x: Giuoco Piano: position after 10…bxc6. For this reason, White has to pull off some imagination again and play a creative move to win the piece back. The idea is to pin Black’s Knight to the King with Re1. Diagram 2y: Giuoco Piano: position after 10.Re1. Once again, Black has two pieces under attack: the Knights on c6 and e4. The best idea for Black is to give up the e4 Knight and protect the c6 Knight with Nc6-e7. This way, taking on e4 won’t be a check for White, and Black will be able to consolidate his position with d7-d6. Diagram 2z: Giuoco Piano: Position after 11…d6. In this position, Black has a small advantage due to being a pawn up. He will aim to finish his development and safeguard his King as quickly as possible. 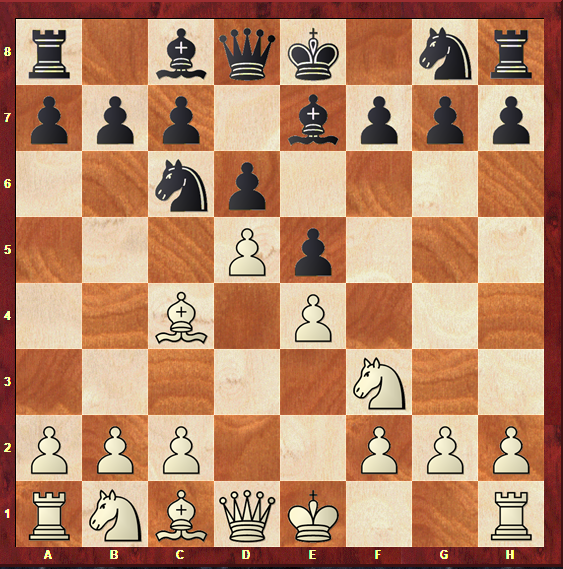 Many White players do not feel comfortable when faced with the possibility of giving away material and entering a favourable position for Black – which has made the quieter alternative, 7.Bd2, much more popular in this position. In fact, it is so much more popular than 7.Nc3 nowadays that it has truly become the main line of the Giuoco Piano. 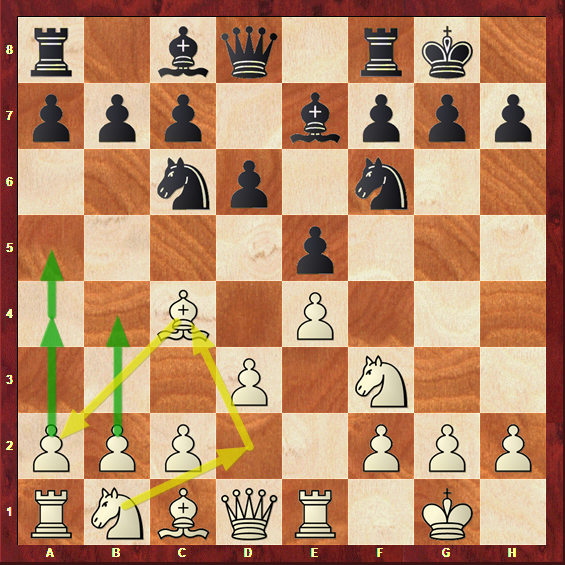 Diagram 3a: Giuoco Piano: position after 7.Bd2. 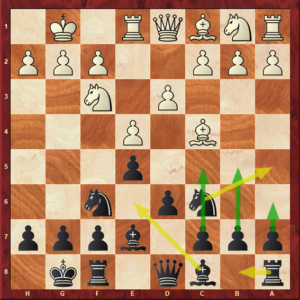 The main option for Black is to exchange Bishops on d2. Black does not want to lose more time retreating his Bishop, and, to strive for equality, he must be quick in breaking through in the center. Black must not allow White to remain with the “perfect” e4-d4 central formation. Diagram 3b: Giuoco Piano: Position after 8…d5. 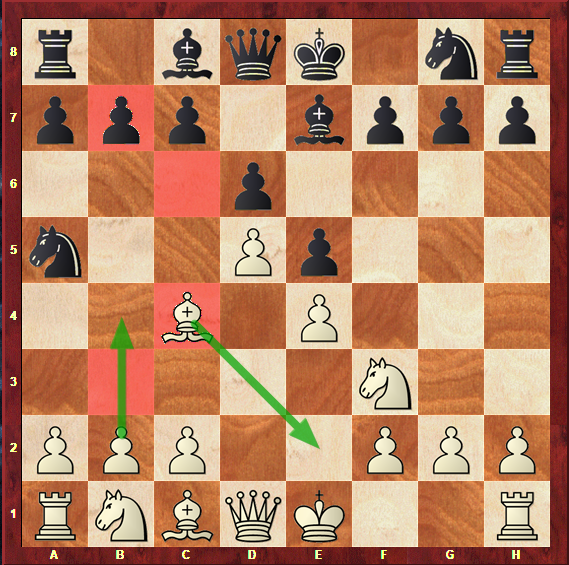 White does not want to give the e4 pawn away for free by retreating his Bishop, so, logically, he takes on d5. Diagram 3c: Giuoco Piano: Position after 9…Nxd5. As you can see, the above position is far quieter and more positional than the lines we had analyzed with 7.Nc3. White has an Isolated Queen’s Pawn – to learn more about this structure, check out this article. This can either be a weakness or a strength, depending on what happens from now on in the game. 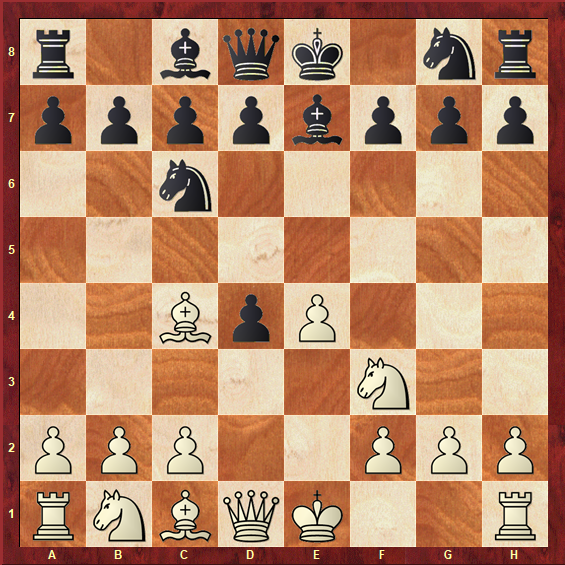 White will avoid exchanging pieces and strive to put pressure along the open files and diagonals, and place a Knight on the strong e5 square; Black, on the other hand, will want to block and attack this pawn, and exchange as many pieces as possible in order to reach an endgame. Put pressure along the a2-g8 diagonal, using the Bishop on c4 and the maneuver Qd1-b3 to potentially develop an attack against Black’s King. Diagram 3d: Plans for White in the main line of the Giuoco Piano. 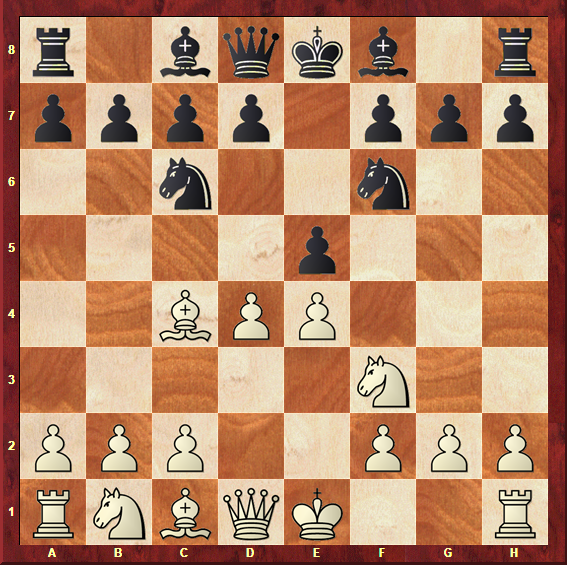 Once White’s Queen goes to b3, attack it with Nc6-a5 to force White to lose some time with his pieces. Diagram 3e: Plans for Black in the main line of the Giuoco Piano. If you have read this far – congratulations! 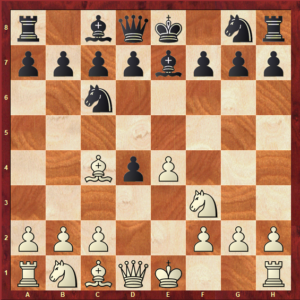 The Italian Game is certainly one of the openings that you will find the most when playing 1.e4 e5 with the Black pieces – or a marvelous option for you to try out with White when playing the open games. There is a great variety of plans and ideas in this opening, as we are sure you were able to figure out for yourself throughout the article. In order not to get lost, here’s a brief summary of what which side should be striving for when playing the Italian Game on the board. White’s plans are to harmoniously develop his pieces: Bishop to c4, Knight to f3 and castle. Then, his main idea is to expand in the center with c3-d4, grabbing a space advantage. 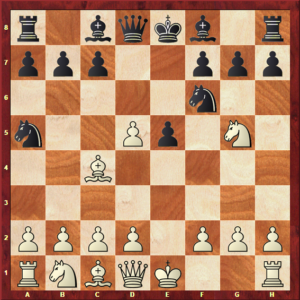 In many lines, White develops a Kingside attack or gambits material for initiative. Diagram 3f: General plans and ideas for White in the Italian Game. Black’s plans are to reply to White’s harmonious development by doing exactly the same thing: Bishop to c5, Knight to f6 and castle. Then, his idea will be to counter-attack in the center. In many lines, he will have to be precise to deal with White’s gambits. Diagram 3g: General plans and ideas for Black in the Italian Game. We hope that this article has been of great use to you, and that you now feel confident and ready to employ this weapon in your chess games. Make sure to check out our other articles on the open games to become a master of chess openings in no time!